Insurance is supposed to be in the business of reducing risk. However within the industry, the insurance sector is hardly seen as indulging in risky behaviors. It is better known for being an industry of cautious professionals, slow to adopt new technologies and processes. But there’s actually quite a bit of gambling happening daily that tech, data, and AI could solve with the right strategy. Take commercial property insurance, for instance. In the United States, this type of insurance is standard — every commercial property owner is required to have insurance on each property in case of natural disaster, fire, or other accidents, so it’s a large and established market. But there’s an issue that’s been plaguing this industry for years: Many of these properties aren’t visited either because they are too small, too far or too many locations — -making it difficult to appropriately assess the right coverage to underwrite. In fact, more often than not, these properties are in rural areas far from major cities or airports. And paying a trained inspector to go to a site is expensive, especially if the site visit requires an inspector to fly, rent a car, and then drive for hours just to tour a single property. Because of this, many companies put off inspections for years. Most properties are inspected once every two to five years, and many go in 10 years between inspections. Insurance providers simply have too many policies to investigate them all. So, insurers by and large live with this dark risk — that is, despite being in the business of risk management, they don’t have the tools to get better insight into the general liability and instead operate with minimal data on the actual state of the properties. One of the most important aspects of good commercial property insurance underwriting is understanding the building’s current state in order to calculate insurance risk accurately. But you can’t do that if you’re not getting enough information or you can’t properly organize and track it. 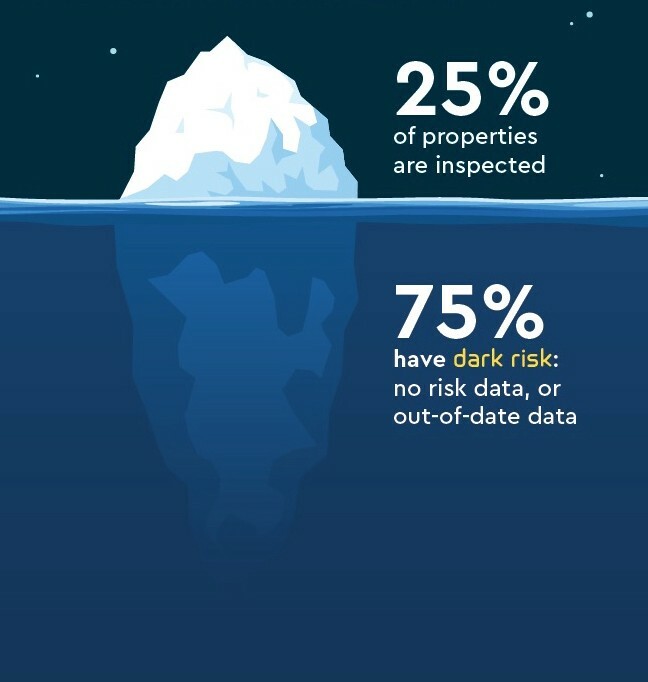 Most commercial property insurers ask business owners to answer questions about the property and sometimes send in a few photos, but that doesn’t give them the kind of data that would actually allow for effective risk management in the long run. Too many insurers operate in dark risk, never knowing enough about each property to identify risks before they become issues. If we look at the data for commercial property insurance, only about 25% of properties are inspected, leaving 75% lingering in dark risk. The risk data on these properties remain either out of date or completely non-existent. Dark risk is prevalent throughout the insurance industry, often begrudgingly accepted as the unpleasant reality of being in the business. But we now have the ability to change that. While the industry is aware of the issue and already investing in technological solutions to try to fix it, they don’t always feel like the most practical solution. Many of the out-of-the-box ideas, like insurance inspections based on aerial imagery, to tackle this problem seem so focused on adding technology, they come across as overly complex and resource-heavy. Why hire planes and drone operators to fly over properties and then try to calculate their risk based on the look of the roof when you could just ask customers to get out a high-resolution video camera already sitting in their pockets? Big data technology is popular enough to have most of the industry intrigued and investing, but lost in the conversation of big data analytics is the fact that data doesn’t have to be expensive to gather. Your customers likely already have the ability and desire to collect that data as well. Remember that your customers want to avoid dark risk too. The state of these properties is important to them and little steps they can do now to prevent bigger problems in the years to come is just as enticing to them as it is to insurers. On top of that, customers are already carrying the best tool to reduce their dark risk, smartphones. Mobile devices are the most underrated sources of data. With just a few minutes, customers can take video and upload images, creating massive amounts of data that can provide unforeseen value for both parties. Trust your customers to be part of a collaborative data gathering process. This could lead to a more proactive approach from your customers that help to identify and track potential risks long before it causes costly damage that needs to be fixed. Be aware that customers today are much more willing to put in the work, especially when it means more accurate (and fair) insurance rates for them and an opportunity to reduce accidents or injuries for their employees. Take a moment to ponder this, instead of waiting years between inspections, insurance customers could sign up for a policy, record a guided inspection of their building with a smartphone, and simply upload the results. The neural networks can do the rest: Identifying wear and tear, flagging issues, and categorizing the data. Each year, customers can upload a new video, showing how the property is changing over time. With a core system that tags and categorizes data as it comes in, you’ll be able to keep a record of changes over time. This kind of information management will allow for change — by collecting and organizing information from the outset, you can also change direction based on better information. And guess who has this up their sleeve…we do. So remember, dark risk is risk that you aren’t even aware of. If you aren’t aware of the dark risk, you have no chance to change your strategy before something happens.